In June 2009 the magazine Der Spiegel reported that the German musicologist Klaus Martin Kopitz had "found proof" that the singer Elisabeth Röckel (1793-1883), who in 1813 became Johann Nepomuk Hummel's wife, was the woman for whom Beethoven wrote his famous piano piece WoO 59 Für Elise. Kopitz claimed that her name being given as "Maria Eva Elise" in a baptismal entry of her first son Eduard in 1814 proves that "Mrs. Hummel called herself Elise" and since she was known to have been on close terms with Beethoven – who according to Anton Schindler once had intended to marry her – "there could be no doubt that the old riddle of the dedicatee's identity had finally been solved". Kopitz's shaky hypothesis suffered a fatal demise in 2011 when I published my article "Die 'Enttarnte Elise'. Elisabeth Röckels kurze Karriere als Beethovens 'Elise'" ("'Elise Unmasked'. Elisabeth Röckel's Short Career as Beethoven's 'Elise'") (Bonner Beethoven-Studien 9, 2011, pp.169-90). By scrutinizing archival sources, most of which had remained unknown to Kopitz, I was able to show that Kopitz's tortured hypothesis was based on no real evidence and could not be upheld. 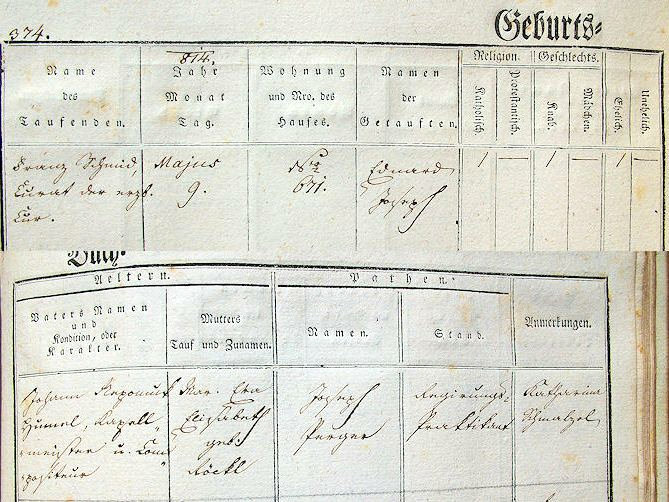 Since Frau Hummel was not present at the christening of her son on 9 May 1814 (women in childbed were not allowed to get up for a time of nine days), her name being given as "Maria Eva Elise" in the register was the result of an arbitrary decision on the part of the officiating priest. 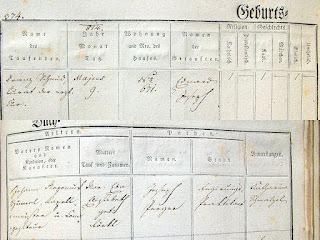 In a copy of the baptismal register which was made at some later time the mother's name "Maria Eva Elise" has already been changed into "Maria Eva Elisabeth". Johann Nepomuk Hummel's widow on a photograph by Ignaz Frisch, taken around 1860 in Weimar. Note the telling inscription "Betty[!] Roeckel-Hummel" (A-Wn, Pf 8.739 : B (1)). The only members of the Röckel family, who can be shown to have actually borne the names "Elise" or "Elisabeth", are Röckel's mother and Maria Eva Hummel's younger sister Eva Elisabeth. The entry concerning the marriage of Dr. Joseph Benedict and Maria Eva Hummel's younger sister Elisabeth[!] Röckel on 11 February 1840 in the Piarist Church in Vienna. (A-Wp, Tom. 8, fol. 138). One of the witnesses was the bride's brother August Röckel. 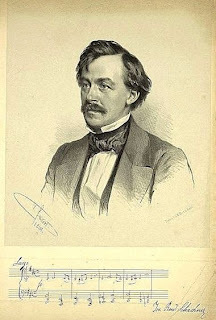 In 1867 Ludwig Nohl published Beethoven's piano piece by permission of the possessor of the autograph, a certain Babette Bredl in Munich who claimed to have received the music as a gift from Beethoven’s friend Therese von Droßdik née Malfatti, ennobled von Rohrenbach zu Dezza (1792-1851). In her will, which I discovered and published in 2001, Therese von Droßdik left her mahogani piano and all the music in her possession to her friend, the German composer and pianist Josef Rudolf Schachner (1816-1896) who in later life resided in Munich. 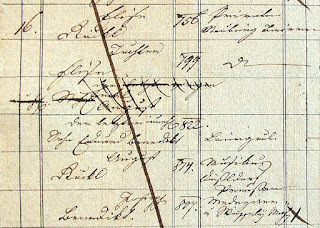 Frau Bredl's previously unpublished probate documents in the Bavarian State Archive prove that Babette Bredl (1792-1880) was Schachner's unmarried mother. According to Bredl's will (which I published in 2011) Schachner was her sole heir, which makes it very plausible that the autograph of "Für Elise" was returned to Schachner in 1880. It should therefore be searched for in his musical estate. The main stumbling block for Kopitz's untenable identification was of course the fact that in no way Frau Hummel could be connected to the autograph of "Für Elise" in Munich. How did the autograph make its way from Weimar to Frau Bredl in Munich before 1865? Until her death in 1883 Hummel's widow kept the lock of hair which she had cut from Beethoven's head on his deathbed, as well as Beethoven's last pen that she had received as a gift in 1827. And the autograph of a piano piece that had been "dedicated to her" should have been of so little value to her that she lightly gave it away? Kopitz never was able to explain this paradox and all his attempts to produce a biographical connection between the families Hummel and Malfatti failed miserably. None of his musings could be backed up by actual evidence. Kopitz published a book, describing himself in the blurb as "currently one of the most renowned Beethoven scholars" and he continued his online propaganda campaign, using several pseudonyms on Wikipedia (where two of Kopitz's pseudonyms were eventually banned from Wikipedia owing to sock puppetry). His media activities culminated in an unintentionally funny appearance in a German TV documentary, where he was staged as "eminent Beethoven scholar doing research in Vienna" in the evacuated reading room of Vienna's Universitätsbibliothek, a library that is not frequented by musicologists. 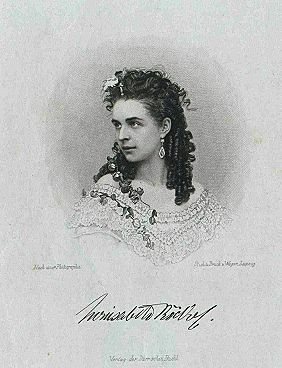 Maria Eva "Elisabeth" Röckel was not the last candidate to be presented as "Beethoven's Elise" and "the solution of the mystery". Time and again the urge to make headlines in the press (or as I put it in German, "der Fall in die Zeitungsspalte") with over-optimistic and half-baked research simply proves irresistible to researchers. Some of them obviously lack the necessary epistemological education to distinguish between proven scientific facts and imaginative hypotheses and make fools of themselves by calling themselves "Miss Marple of musicology" and presenting a porous theory as "new solution". They are unable to understand that the name "Elisabeth" and a woman's personal acquaintance with Beethoven are not enough to identify her as "Beethoven's Elise". The identification stands and falls with the person's direct connection to the lost autograph of the Bagatelle WoO 59 in Munich. Up to now only two women named Elise have been shown to have had such a close connection: Josef Rudolf Schachner's wife Elise (née Wendling) and his daughter Elise Schachner. Therefore – and because I also claim the right to present a hypothesis – I have already suggested some time ago that the dedication "Für Elise" on the autograph was not written by Beethoven at all. The composer only wrote the words "am 27 April  zur Erinnerung von L. v. Bthvn" and the dedication "Für Elise" was added by Schachner decades later when he gave the autograph as a gift to his wife or daughter. This scenario – curious as it may seem – is still more likely than the two wrong dedicatees that have been presented so far. All the people involved in my theory had direct contact with the autograph and under the premise of Occam's razor the role of Elise Schachner as not Beethoven's, but "Schachner's Elise" looks quite reasonable. Because the most important sources concerning Maria Eva Hummel's name have all been presented in my article, I have little to add to my arguments, except for three hitherto unknown documents which I shall publish here. Two of them I discovered within the last two years and one I simply failed to remember in 2010, because I had already found it much earlier. gasse N. 56 zu ehligen. so bittet er hiemit darum. Wien am 20. Aprill 1813. The undersigned is determined to marry Maria Eva Röckel, residing at Rosengasse No. 56 [today Fillgradergasse 8] next to the Kothgasse. He has made all the necessary arrangements. But since the priest of the parish ob der Laimgrube requests the supplicant to produce a marriage permit from the laudable captaincy, he hereby requests this document. The permission of the Stadthauptmannschaft was granted the same day by the councilor Sebastian Angermayer. Second, there is an entry in a conscription form of the Theater an der Wien which I already found in December 2005, but forgot to consider in my 2011 article. 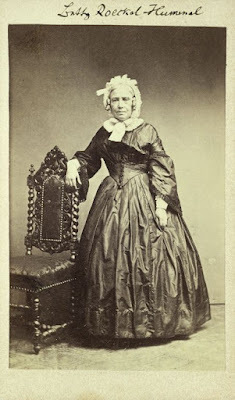 It proves that in her youth Maria Eva "Elisabeth" Röckel lived as a foster child together with her older brother, the singer Joseph Röckel (1783-1870) and the familiy of the diplomat Felix Milder and his daughter, the soon to become famous opera singer Anna Milder-Hauptmann. In my 2011 article I showed that Maria Eva Röckel and her youngest sister Eva Elisabeth sometimes exchanged their first names. In 1827 Eva Elisabeth appears as "Maria" in the sources, because her older sister Maria Eva is called "Elisabeth". As soon as "Elisabeth" (Betty) Hummel had moved from Vienna to Weimar, her younger sister Eva Elisabeth called herself "Maria Elisabeth" or just "Elisabeth" again. In the probate documents of Hummel's mother-in-law, who died on 7 June 1840 in Vienna, the original names have been put back into place: Hummel's wife (the supposed "Elise") is listed as "Eva Hummel" and her younger sister is named "Elisabeth Benedikt". Michael Strumpfstrickermeister zu Neuburg am Wald in der Pfalz, H. Joseph Roekel ehemaliger Theater Direktor in London, Andreas bef[ugter] Schneider, zu St. Ulrich Nr – Fr. Eva[sic] Hummel, Hofkappellmeisters Witwe zu Sachsen Waimar, H. Alexander Roekel, Hofkanzellist zu Weimar, Fr Elisabeth Benedikt, Med. Dr. Ehegattin im Sterborte". 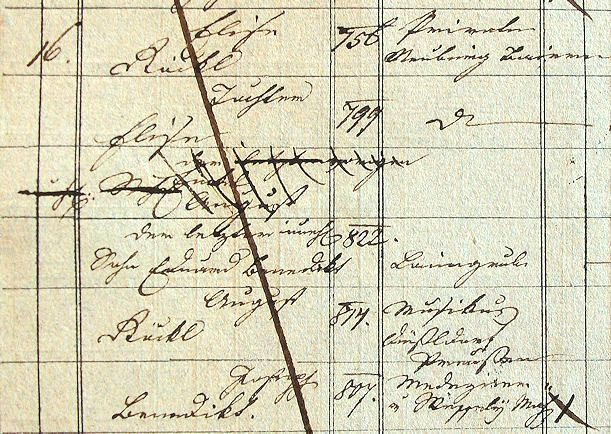 The children of Elisabeth Röckel the elder, listed in her 1840 probate file (A-Wsa, Mag. ZG, A2, 1824/1840). The "Elisabeth carousel" in the Röckel family saw a late highlight in the appearance of Maria Eva Hummel's grandniece Elisabeth, a renowned actress, who called herself Louisabeth Röckel. In 1869, in Vienna, Louisabeth Röckel married the railroad official Heinrich Mathes and continued her career under the name Mathes-Röckel. It is quite obvious that Nohl was not allowed to reveal the dedicatee's true name. He had to follow the requests of Babette Bredl, who wanted her relation to Schachner remain a secret. Nothing about your scenario is obvious! Schachner's mother, Babette Bredl, called herself his aunt in various documents, including his marriage contract. That's all she needed to tell Nohl if she wanted to keep her relationship to her illegitimate son a secret. I never claimed that this scenario "is obvious". You retrospectively impose your reasoning on Babette Bredl's mind which in my opinion is rather bizarre. You should discuss your point of view with Dr. Jürgen May of whose article "Eine Bagatelle und andere Kleinigkeiten" (Bonner Beethoven-Studien 11) you seem to be unaware. However he may not be willing to enter into a discussion with an anonymous person. And neither am I.